On This Day…27 August | What I think About When I Think About Writing. It’s Freaky Friday, so it’s time to get freaky with another edition of On This Day. Are you suitably freaked yet? No? Well, you should be. Sigh! 1798 – Wolfe Tone’s United Irish and French forces clash with the British Army in the Battle of Castlebar, part of the Irish Rebellion of 1798, resulting in the creation of the French puppet Republic of Connaught. 1928 – The Kellogg-Briand Pact outlawing war is signed by the first fifteen nations to do so. Ultimately sixty-one nations will sign it…and then have Corn Flakes for breakfast. 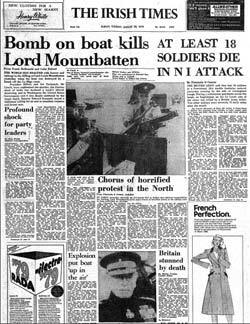 1979 – An IRA bomb kills British World War II admiral Louis Mountbatten, 1st Earl Mountbatten of Burma and 3 others while they are boating on holiday in Sligo, Republic of Ireland. Another bomb near Warrenpoint, Northern Ireland kills 18 British soldiers. 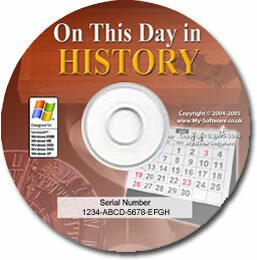 1991 – The European Community recognizes the independence of the Baltic states of Estonia, Latvia and Lithuania. All of these countries have, at some point, beaten the Republic of Ireland soccer team. BOO!! Lady Antonia Fraser, the British author of historical fiction and the “Jemima Shore” mysteries is a stately 78. Barbara Bach and husband Ringo Starr in the movie "Caveman." No, I didn't see it, either. Bond girl and wife of Beatles’ drummer, Ringo Starr, Barbara Bach is a sultry 53. Denise Lewis, the English heptathlete is a sprinty 38. The world lost a legend of music on this day in 1990: the great Stevie Ray Vaughn. I’ll let Stevie take you into your day and night with Voodoo Child. This entry was posted in On This Day and tagged Baltic, Barbara Bach, Denise Lewis', Ireland, Irish Rebellion of 1798, Jemima shore, Lady Antonia Fraser, Northern Ireland, Republic of Ireland, RingoStarr, Stevie Ray Vaughn, World War II. Bookmark the permalink. Have a fantabulous Friday, JM! I thought you’d be interested in this, Emily. I’m glad you checked it out. some years ago I met a old lady from Estonia….wonderful lady passed away. Her name was Laida…thank you for reminding me of her:) How precious freedom is!